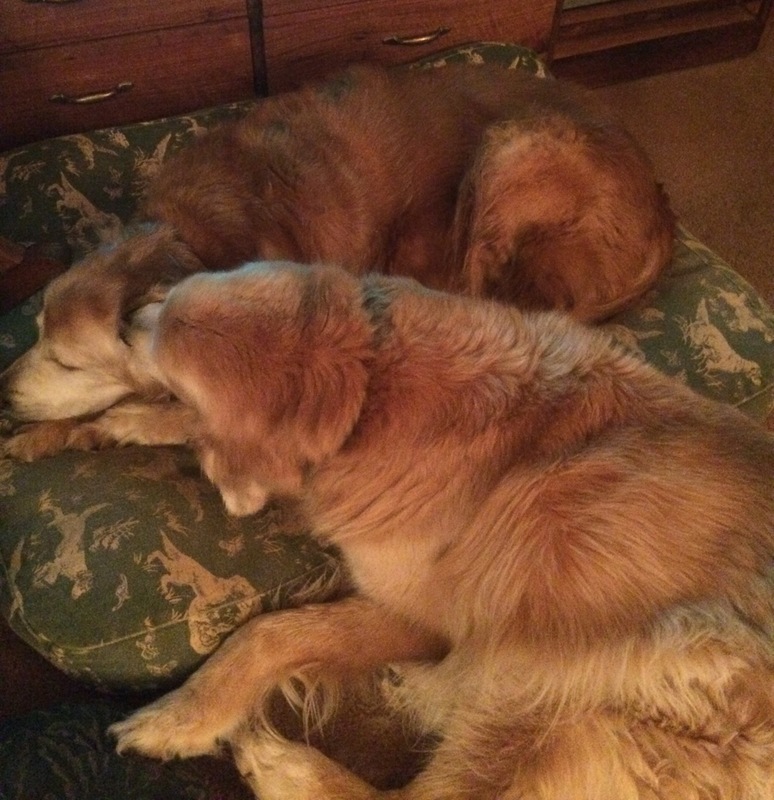 Since Hubby, Ducky and I told Shadow how much we love her – will always love her – and then let her go be with her soul-sister Callie. 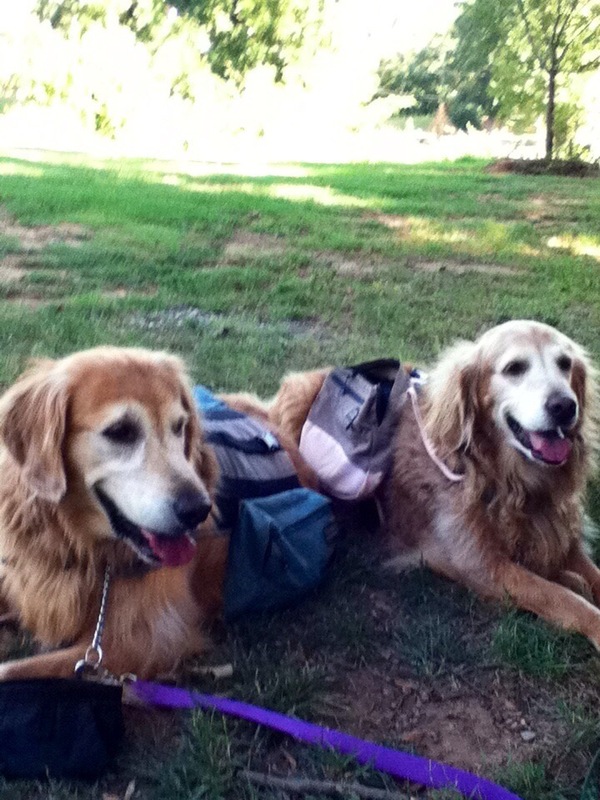 This is my favorite photo of my Golden Girls from several years ago…. We miss our sweet girl so much. Ducky misses having company when we have to leave the house. She misses having a buddy to share the perimeter patrol duties with, and to bark at the neighbors’ dogs with, and to fuss at over time on the dog beds. About the only thing Ducky doesn’t miss about Shadow is the competition for our attention. Hubby’s not a big believer in spiritual visits. It’s a shame for him. Being open to them myself, I feel better knowing my Golden Angels are always with me. And always watching over Ducky as well. It’s just so hard not having them here physically to love on and watch play with each other and cuddle together and discipline Ducky. Anyway, it’s at least a little easier to look at photos of my girls without dissolving into a puddle of tears. 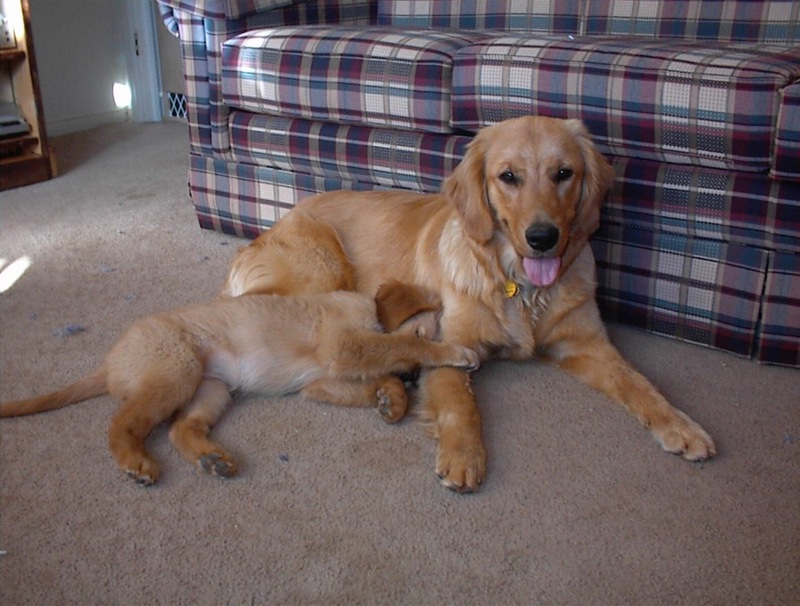 So, here are some pix of Callie and Shadow together when they were still pups…. 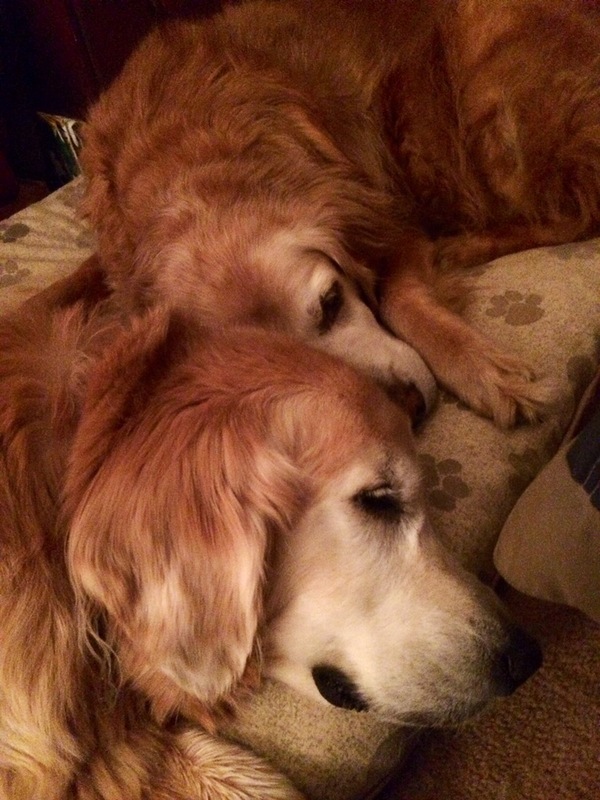 My Golden Girls were rarely apart in life; and when they were apart, they spent the time looking for each other. Now they’re together again, the way they were always meant to be. Hubby, Ducky, and I have so much to be thankful for that I’m glad Brian of Brian’s home has set up (and maintains) the Thankful Thursday Blog Hop. We are thankful to all our friends and family for all the love and moral support you gave us these last several weeks while we dealt with Shadow’s heartbreaking decline and the decision to let her join her sister, Callie, in Heaven. We are thankful for our wonderful vets, Dr. Steve Coluqhoun and Dr. Tyler Simpson and the wonderful staff at Sunrise Animal Hospital who gave our sweet Shadow the best care anywhere. In fact, Dr. Steve has been caring for all our furry and feathered family members for a long time. We are thankful for the love and devotion of all our dogs – Kissy, Callie, Shadow, and Ducky – over the years we’ve been together. And right now especially for Ducky who has been helping us deal with the loss of her beloved sister. She misses Shadow, too, and still looks for her. I try to limit her time alone in the house to an hour these days. Just like I did with Shadow when Callie first got her angel wings. So, that’s a part of what we’re thankful for. Click on the links below and see what other bloggers are thankful for this week. These last several weeks I’ve been watching Shadow closely. 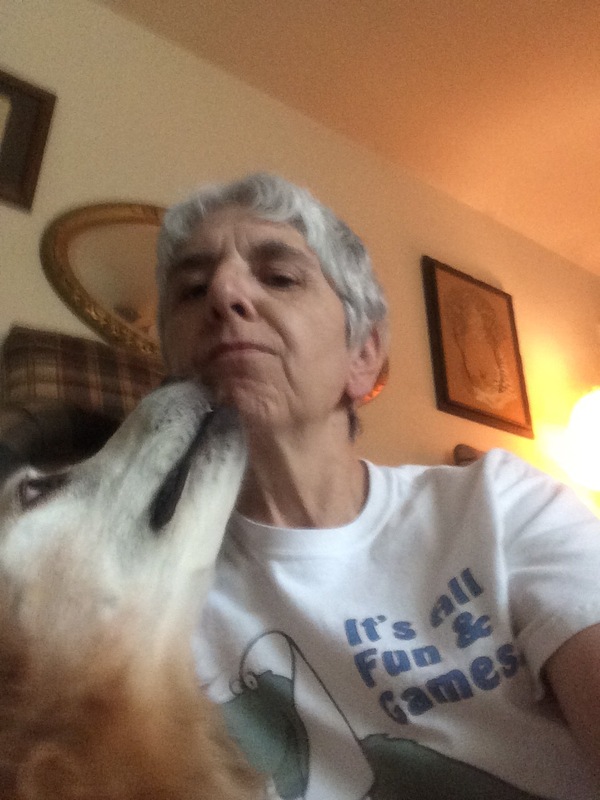 At times she seemed in great shape – playing with Ducky, chasing her favorite ball, almost running up the three steps to the main part of the house – and other times she stumbles or misjudges her footing on the steps. Those tough times have really been breaking my heart these last few weeks. Ten days ago she stopped eating her food. And this is food she has loved from day one. She was taking her pills – wrapped in pieces of pill pocket – and treats. She especially loves the treats I bought from Jan at Wag-n-Woof Pets. And on Wednesday of the week before last, when she was so hesitant to go down the steps to the back door, I immediately called the vet and made an appointment. Meanwhile, with hubby’s help, I got her outside and walking around. She did well. On Friday morning, we went to see the vet. After a hands-on body exam, the vet said that my poor girl had somehow pulled the groin muscle in her right rear leg. And sure enough even I could feel how tight it was. It will take 10-14 days to heal. And her appetite should follow suit. We decided to treat her with muscle relaxants. On Day Five I was only starting to see slight improvement. She slept most of the day. And she balked at going down the steps to the back door. 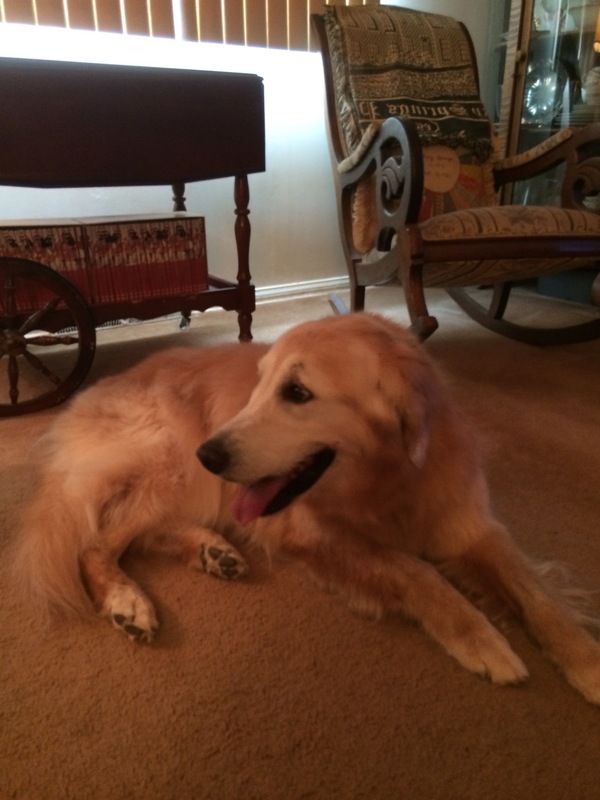 This past Wednesday was Shadow’s biannual senior exam. The muscle relaxant was already doing its job on the groin muscle; but it was also suppressing Shadow’s appetite and making her seem almost lethargic at times. Getting her up on her feet and outside for bathroom breaks – even with hubby’s help – was difficult at best. Anyway, her labs came back pretty close to normal. Once she’s been off the muscle relaxant and the week’s worth of NSAIDs to help strengthen her joints for two weeks, we’ll do the labs again to make sure everything is back on track. It’s now Day Nine of the muscle relaxants and Day Three of the Meloxicam for her joints, and I’m finally seeing promising improvements in Shadow’s overall mobility. Her appetite is still mostly suppressed, but after a few days of not even wanting treats, she’s back to taking them from me again. It’s not great, but it’s a start that makes this dog mom feel better. Knowing my sweet girl’s age is catching up with her breaks my heart. She’s had some tough times in the three and a half years since her older sister – and best friend – got her angel wings; but Callie has stayed with her in spirit and helped me get her through it all. This past week in particular I was beginning to wonder if Callie was trying to tell me Shadow’s time to join her was coming soon. I know it will eventually; but I don’t think Shadow’s ready quite yet. Her eyes are still bright, and she’s back to fighting for her independence. I know she misses Callie, but Ducky’s been keeping her company and mostly been a sweet little sister. Especially this past week. Happy 6th Gotcha Day Ducky!!! Oh, Ducky, you crazy little stinker! I can’t believe it’s been six years since the morning I saw you on GCAC’s urgent list and called “Daddy” at work. He said “go get her!” and our lives changed forever. You were so cute! At a few days past seven months, you were still a puppy. And you were a handful! All explosive energy. You drove Callie and Shadow crazy, even testing Callie’s seemingly unlimited patience at times. You wore me out with your antics. You’ve come a long way little girl! When we said goodbye to Callie that morning, you kissed her head and jumped back up in Daddy’s lap. It was so cute. I almost wish I’d gotten a picture of it. And when we got home, you tried your best to cheer Daddy, Shadow and me up. And you were sweet to Shadow. You’ve had your snarky moments when I’ve yelled at you for being ugly toward Shadow. And you’ve driven me to distraction with your incessant barking. BUT I wouldn’t give you up for the world. Neither would Daddy, or even Shadow. Over the three years since Callie got her angel wings, you’ve grown into a sweet little “pup”. You finally seem to realize that Shadow IS your best doggie friend. And your older sister. You treat her now the way you treated Callie, with respect and even affection from time to time. And she even misses you on days when you’re at daycare. I was in Florida, helping your Uncle Doug, on your 6th birthday so we’ll have a double celebration today. Maybe we’ll spend most of the day playing outside, weather permitting. We love you to the ends of the universe and back, little girl! You are our little entertainer. I haven’t put up a blog post in a couple of weeks; and the ones I’ve put up lately have been mostly about either one or the other of my dogs. So I thought I’d serve up a helping of both my dogs. They get along pretty well these days. Some days they mostly ignore each other, and some days they look for squirrels together. *BUT* they get along. Since her stem cell infusion nearly two months ago, Shadow has been rejuvenated. She has a new lease on life. That sparkle is back in her eyes. And her beautiful, floofy tail is more often than not in line with her backbone and wagging, or at least swishing back and forth. And Ducky? Oh, this little one is quite the character. Just watching her stalk and chase the squirrels is entertainment without equal! She would literally spend the entire day in the back yard if one of us were out here with her. Have a tail-wagging weekend everyone!! The things I missed while I was away from home are too numerous to count. Dates like Ducky’s sixth birthday; like Valentine’s Day. And dates like Shadow’s half birthday on what has always been Callie’s full birthday. And big things like watching Shadow go down (and back up) the steps to the office/laundry room (and back door) unassisted. And little things like watching Ducky stalk the squirrels, run the fence lines with the neighbors’ dogs, and chase the birds off the fence posts. And replenishing things like Hubby’s hugs and good night kisses, Ducky’s puppy kisses, and Shadow’s “hugs” against my thighs. In between re-organizing things the way I want them, cleaning up a mess created by inclement weather, and getting back into somewhat of a routine, I’m trying to spend less time on my devices and more time with my family. So forgive me for being so behind in reading your blog posts. My sweet girl is 13. Where have the years gone?! Seems like only yesterday we brought her home to be Callie’s little sister. I love this girl with my whole heart. She gives us her heart unconditionally. She loves Ducky in spite of the little brat’s attitude. Shadow has been my rock since Callie got her angel wings. She has taken over Callie’s role as my furry confidant, my furry shoulder to lean on in tough times. 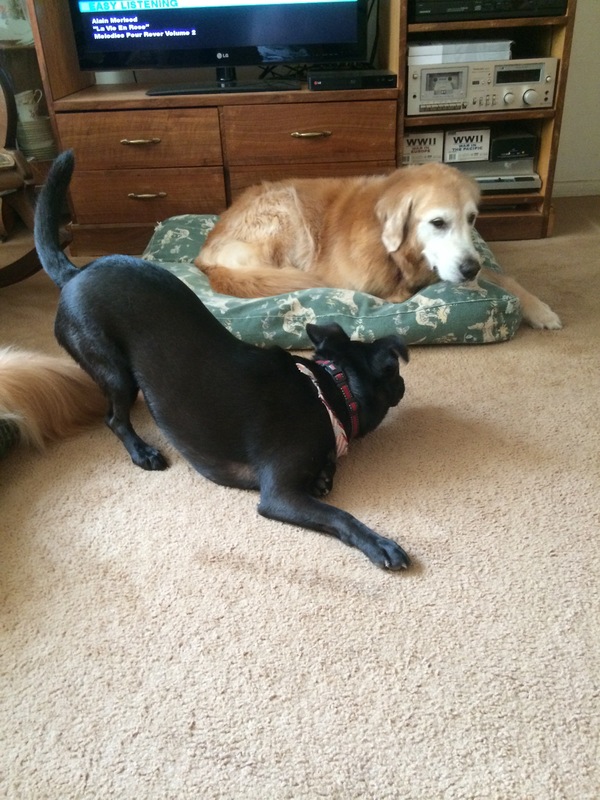 Callie was an excellent teacher; Shadow was a star pupil. Shadow has had her own challenges these last two years, but she has overcome them with great spirit. We’ve been dealing with some arthritis issues, but the Treatibles CBD oil supplements, plus walking on the treadmill every day (in addition to play time), is helping a lot. She does have some difficulty walking/standing on the kitchen (linoleum) floor at times. The floor mats I bought to help her aren’t any good because they slide all over the place. And I just haven’t been able to get back to Target to exchange them. Yet, despite her issues, she’s still a happy pup. She misses Callie, naturally; but as long as we give her lots of love and attention, she’s content. And I hope she’ll be happy and healthy for at least another few years. Shadow is – and always has been – my good, sweet girl. 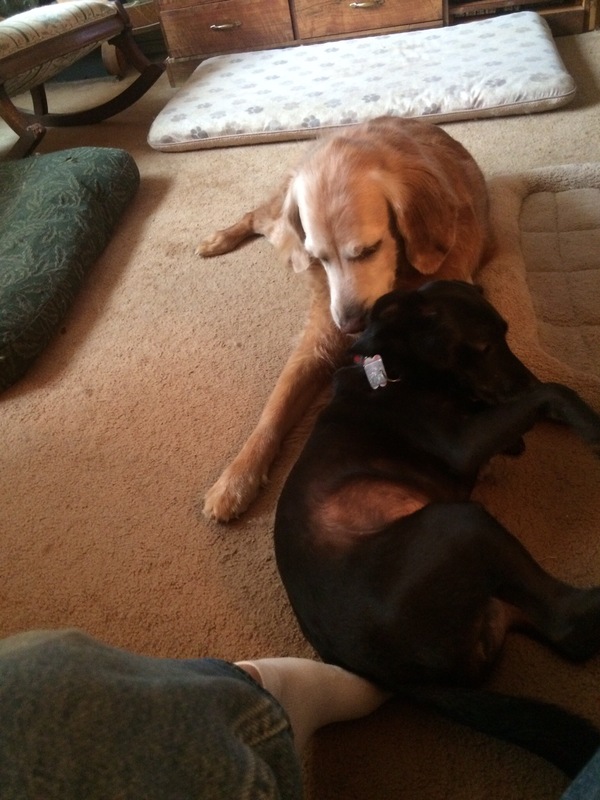 She doesn’t dole out kisses the way Callie used to and Ducky does, but she is a very loving girl. She doesn’t like hugs, but will tolerate mine (so I try to limit them to those times when I really need them). She loves all of us but she’s always been my dog…I’m her special person, especially since Callie got her angel wings. Happy Thirteenth Birthday my sweet girl!! I love you and – like your sisters – you will always be in my ❤️. Our sweet Callie took her final journey two years ago this morning. Some days it feels like yesterday. After I read the first draft of this post, I went back and read the posts I wrote last year around the time of Callie’s first “anniversary” in Heaven. Everything I wrote in those earlier posts holds true now. I miss my sweet girl more every day. But Shadow and Ducky fill my hours with unconditional love and moments of hilarious entertainment that take the edge off my heartache. For that I am eternally grateful. And knowing that their older sister’s spirit is always with us, watching over us, gives me great comfort. It’s hard to believe that today is Ducky’s fourth Gotcha Day! Time has flown by since our little demon joined the family! Her sweetness with the people and doggies she loves. She gives puppy kisses galore. And, according to her dog-daddy, to excess at times. Her ability to keep Shadow young. Since Callie got her angel wings, Ducky has matured a lot and realized that Shadow is her best doggie friend as well as her sister. She still has her snarky moments over a toy or ball, but those moments continue to dwindle. They chase each other in the yard. (I have to get a video clip of that one of these days!) And they play in the house. 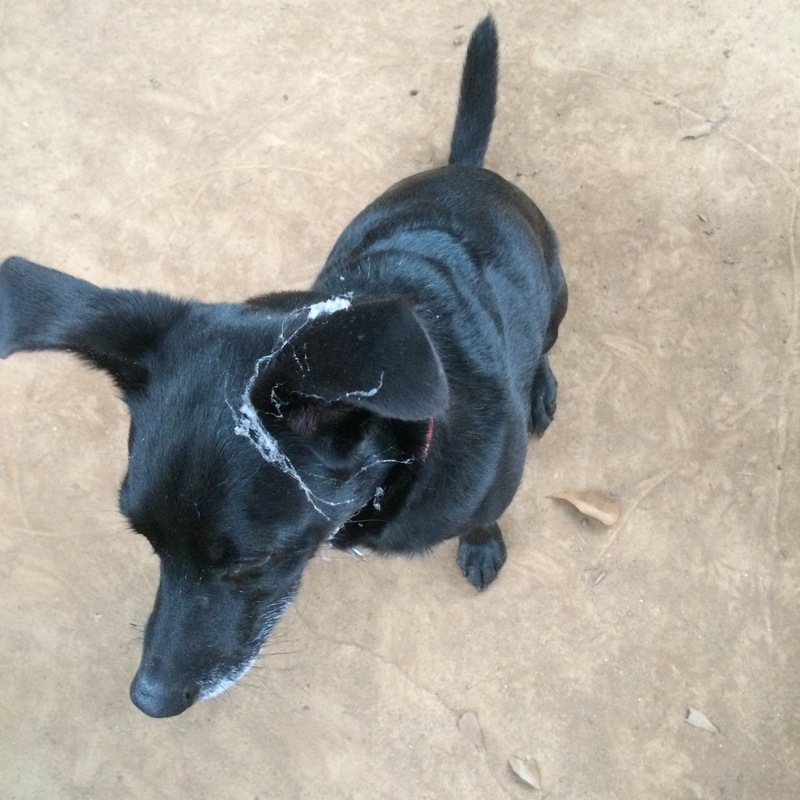 She barks at anything and everything she hears or sees – when the spirit moves her. Some days she’ll bark at the breeze blowing or a tree branch falling on the roof. Other days she’ll just look up and then go back to her nap. She barks at hubby when he first comes out of the bedroom in the morning. He gets grumpy over it – he’s definitely NOT a morning person – but I have to admit it’s kinda funny, even if it is annoying at times. She runs the fence line on both sides with our neighbors’ dogs. There’s nothing aggressive in any of their body language. They’re just saying hello and getting some exercise running back and forth. When she’s had enough, she walks away. She is still teaching me patience. Even though she’s not as hyper as she was four years ago, she does still have those moments. I don’t have my helper (Callie) here any more to show me how to deal with those moments, so I struggle at times. Especially when she’s being snarky with Shadow. Or blowing me off.